Lammin biologisen aseman Ympäristötutkimuksen Säätiö: Green mining: oxymoron or the way of the future? Green mining: oxymoron or the way of the future? As world demand for minerals steadily increases, it would make sense to search for solutions that make resource extraction less harmful to the environment. 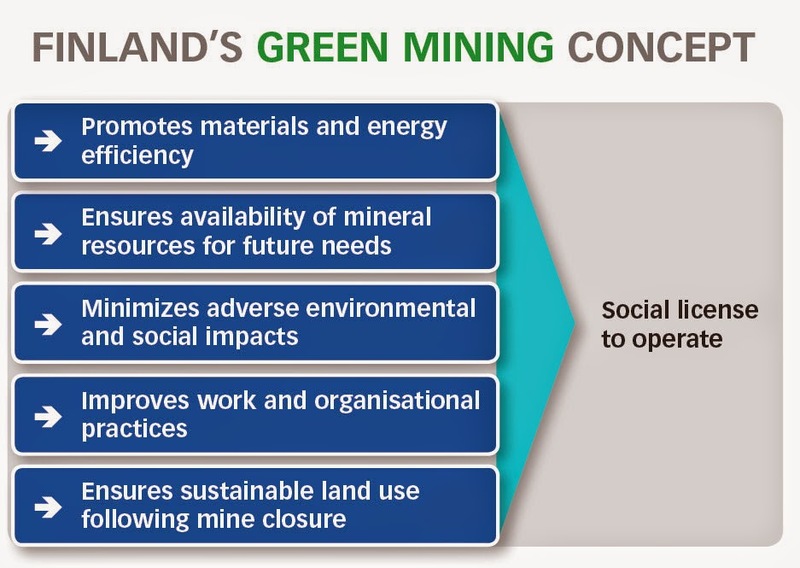 In a recent presentation as part of LBAYS’ fundraising event, Elias Ekdahl, director general of the Finnish Geological Survey, laid out plans for developing a mining industry that is environmentally stable and sustainable. I must admit that up until the moment that the presentation started, I had no idea that ‘green mining’ is even a concept. Looming large in my mind are images of mining that cast the industry in a very poor light: While doing fieldwork I have experienced firsthand the social and environmental aftermath of mining in the moonscape of one of Canada’s largest lead-zinc open pit mines. This is a place where the adjacent town’s water supply is constantly monitored in case the tailing ponds leak contaminants and threaten public health. Ground water will have to be monitored for “hundreds of years”. Tar sand extraction in my native Alberta has now been hailed worldwide as the centerpiece for human desire to harm the environment to turn a profit. The events of Talvivaara, in Finland also provide ample warning of what can still happen in a society where environmental controls should be first rate. But what of green mining? Is it doomed to fail by the very combination of those two words, which scream, at least to the uninitiated, oxymoron? But, to hear that work is being done to reduce the environmental impact of mines was music to my ears. In retrospect though, Finnish citizens should expect nothing less from the Finnish Geological Survey. In his presentation Ekdahl laid out the basic premise of green mining, which aims to integrate the whole process from resource exploration and extraction to the recycling of finished products. One of the ideas pushed strongly in the presentation is that the future of mining is underground. The open pit concept, which I imagine had gained favour for economic reasons, will be replaced by underground mines. This is partially a function of resources at the surface being already exploited, so it is now becoming worthwhile to go back underground. This will allow the nature at the surface to be left untouched, but there are still many challenges, among them how to prevent contamination of ground water. According to Ekdahl, Finland is at the forefront green mining technology, and aims to be a world leader in the further development of it. I see this as a very worthwhile endeavor, however, we discussed afterwards about the roadblocks to the implementation of the technology. I asked Ekdahl to what degree there is international control over environmental standards, and the answer was that it is extremely difficult to implement, because countries are very protective of their rights to exploit their own resources. This got me to thinking, that even if the technology existed, it will have difficulty competing because companies will gravitate toward countries where environmental standards are lower and therefore resources are cheaper to extract. I wondered whether a massive public awareness campaign, and pressure on international mining companies might be the only route to bring about change. Moratorium for mining in Finland? The floor was then handed over to member of the EU parliament, Sirpa Pietikäinen. Pietikäinen spelled out the problem in simple terms. Each and every one of us is responsible for the detrimental impact of mining, using our desire to consume and the specific example of the short product life of mobile phones. She questioned whether buying a new phone every two years or less can be combined with the ethical desire to protect the environment. Then she shifted away from a global focus to consider what the best strategy for Finland in the resource extraction industry is. Pietikäinen’s recommendation would be shocking for anyone involved in the mining industry, in that she called for a moratorium of mining in Finland until resource extraction methods are truly green. The present state of affairs does not meet her standards for environmental protection, and she espoused the idea of short term pain for long term gain. In the future resources will be extracted in way that harms the environment less, and Finland should see the resources as a long term investment. Those same resources will be worth much more in real terms 20-30 years from now, and why should we not let future generations benefit from them?